Join us for Fall Preview Day at Brock University! Join us Sunday, November 4 from 11 a.m. to 4 p.m. to experience all that Brock has to offer. You will have the opportunity to tour our campus and residences, meet faculty and staff, and attend information sessions or Experience Brock options. Remember, this day is all about you! What is there to do at Fall Preview Day? Attend presentation sessions or Brock experience opportunities. Review the schedule below to determine the sessions you’d like to attend. Note the time(s) and room(s). The Information Fair will be open from 11 a.m. to 4 p.m.
Campus tours and residence visits will be available all day until 4 p.m.
Tours depart outside of the Information Fair 1 p.m.
Tours depart outside of the Information Fair 2:30 p.m.
South Block 203 1 p.m.
Meet in the South Block hallway at 1 p.m., immediately following the Humanities presentation. South Block 204 2 p.m.
Meet at the Computer Science booth in the Information Fair 3 p.m.
(access via Hot Spot 4) 3 p.m.
Ian D. Beddis Gymnasium • 11 a.m. – 4 p.m. Explore all our programs and services. Faculty, staff and student representatives will be in our Ian D. Beddis Gymnasium, ready to chat and answer any questions that you may have. Tour our beautiful campus via our unique ‘Guided Hot Spot’ tour program. See classrooms, seminar rooms, service areas, student meeting spaces, recreational areas and more. Visit the stations around campus to take a tour of our campus. Discover why Brock is known for having one of the finest residence systems in the country! Tours will be offered throughout the day, highlighting the various residence styles Brock offers. Plan to spend approximately 20 minutes in each residence. Please note: Tours will begin from Decew and Lowenberger Dining Halls. Transferring from an Ontario college or university? Visit our Admissions team for on-the-spot applications, transfer credit assessment and admissions. 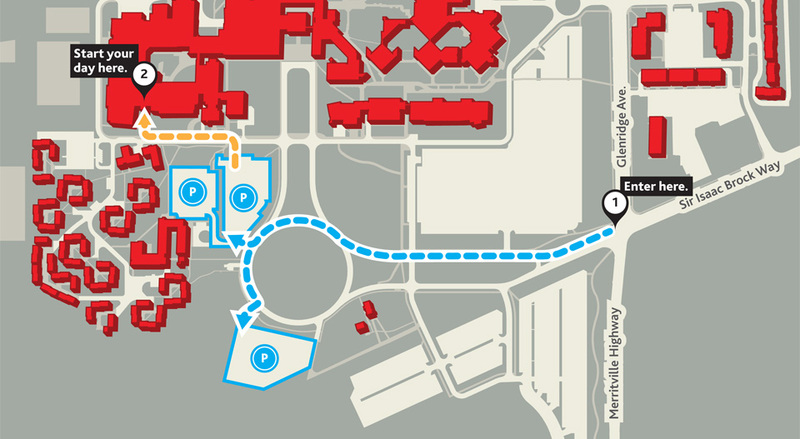 When you arrive at Brock, use the main entrance, and follow the signs for parking. We’ll do our best to get you a spot as close to registration as possible. Once you’ve parked, follow the signs to Registration in Walker Complex (or follow the wacky inflatable tube men), sign-in with us, and start your day. Campus Store • 11 a.m. – 4 p.m.
Don’t forget to stop by our Campus Store to get your own Brock gear before you leave campus. We offer great Brock clothing, stationery, accessories and more. Staff will also be available to explain our procedure for buying and selling textbooks. As a guest, you’ll receive a 10 per cent discount at the Campus Store on clothing, start stocking up on your Brock gear now. Learn more about our Begin at Brock $10,000 prize! By registering and attending Fall Preview Day, you’ll be entered into a draw for $10,000 towards your Brock University experience! The winner will receive $10,000 to put towards their Brock tuition and residence expenses for the 2019-20 academic year. And, the more you engage with Brock, the more chances you’ll have to win! Additional Begin at Brock $10,000 prize entries are created for those who attend Open House, or participate in a campus tour. Don’t worry! You can still register on-site.